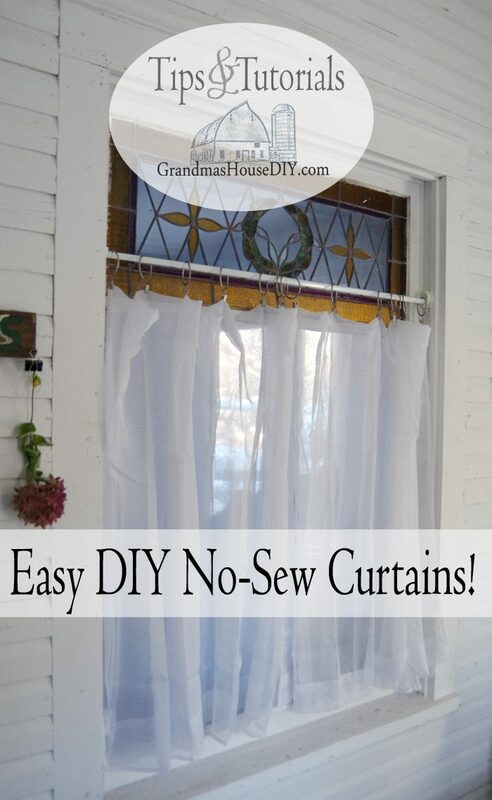 Easy, no-sew curtains! 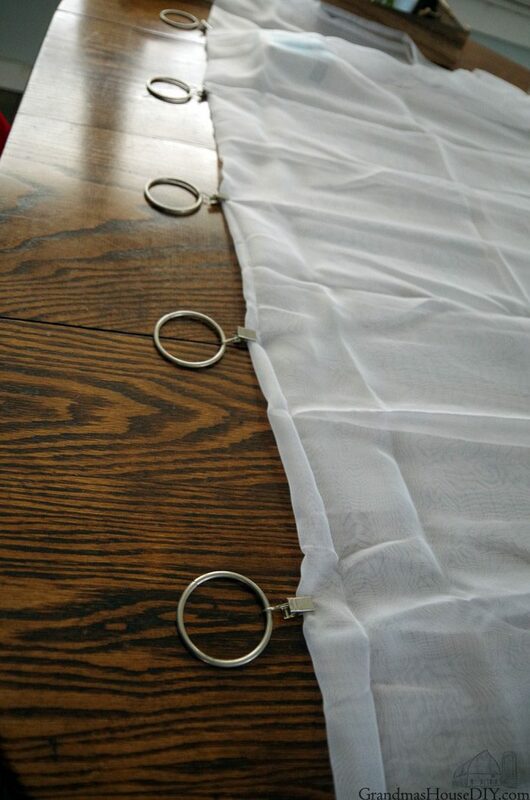 With the completion of my old steel bed with a brand new makeover (and several pieces yet to come) I made an easy no-sew bed skirt out of canvas drop cloth and, at first, I considered using the same material here. But canvas over this gorgeous old stained glass window just felt too heavy and harsh to me. 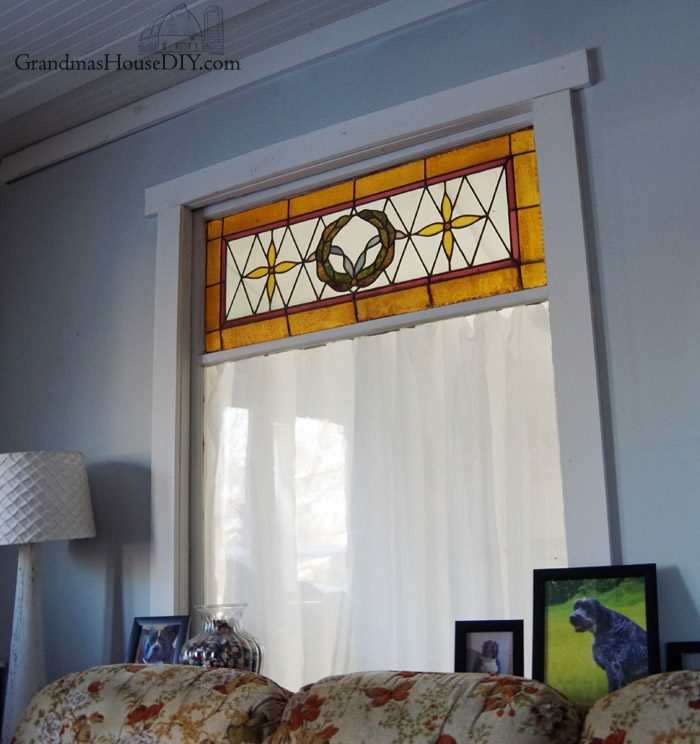 I wanted something light and I really did NEED something because that big stained glass window lies directly between my new guest bedroom and my living room! This room is an absolute stunner, the old house siding now painted white, the vaulted ceiling, the ancient painted wood floor and, of course, the real statement piece: that glorious stained glass window. The only problem is that it is in fact a window that looks right on in to my living room. So, I needed to come up with something to give my guests some kind of privacy and, as I mentioned earlier, canvas was just a little too heavy to me. 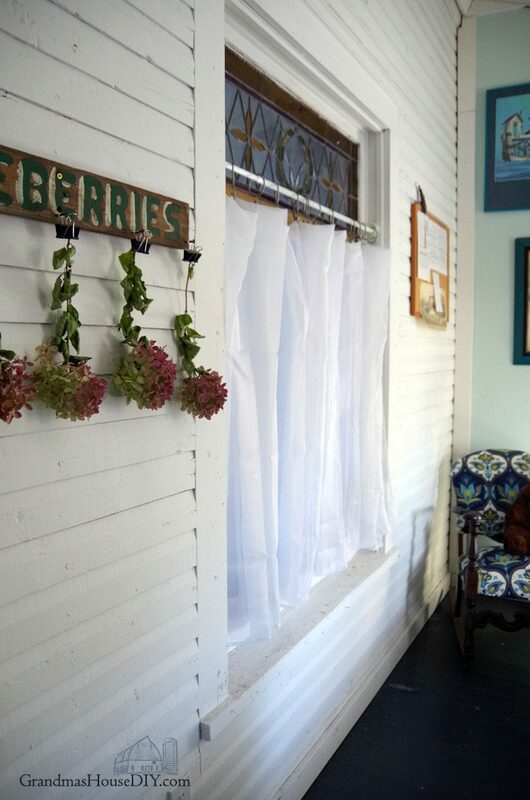 I had these lovely sheers leftover from when I made my closet doors they were REALLY inexpensive off of Amazon and then all I needed was something to hang them with and something to hang them from. 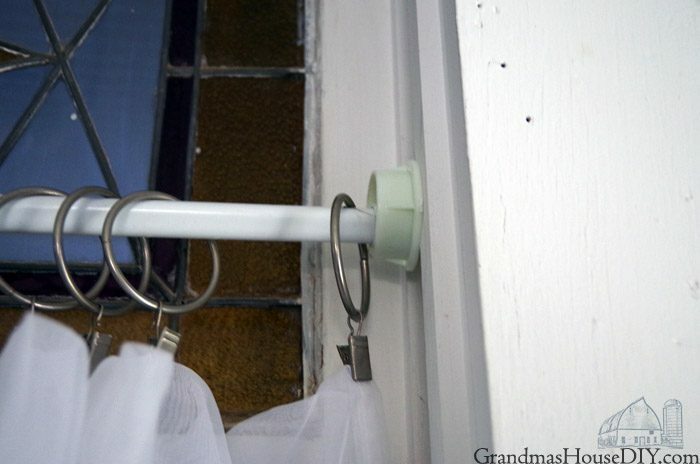 I purchased the rod and the hangers that included little clips so cutting the curtains wouldn’t be necessary. I did not want to cover the actual stained glass portion of the window so I measured beneath it and knew I needed about 40 inches and, by some kind of miracle, these sheers were that measurement folded in half! Then I just needed to add my clips on and hang my rod! Don’t let this rod fool you when it says it is a “tension rod” if it is then it could only support its own weight lol I used little end brackets for a closet rod that I happened to have and just rested it in them. I was excited to see that these sheers do, in fact, give a decent amount of privacy (minus shadow puppets at night of course) but they still allow my living room to get some light too! Perfect! The room sounds so lovely and inviting. That is such a beautiful window. That curtain is perfect since it still lets some light in but it provides privacy. Your guest room is going to be so cute! 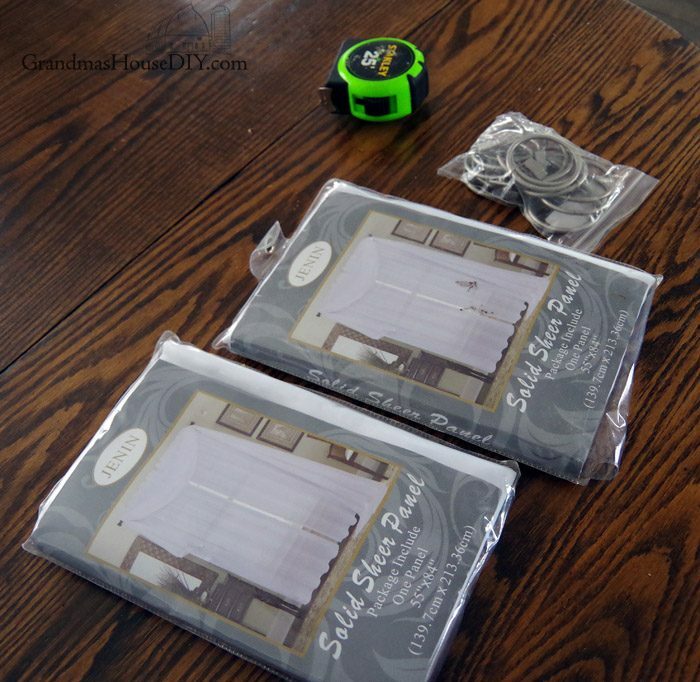 Your curtain did the trick – quick no sew, lets in light and provides privacy. These look so simple!! I need some for my bathroom and laundry room. You have the best ideas. 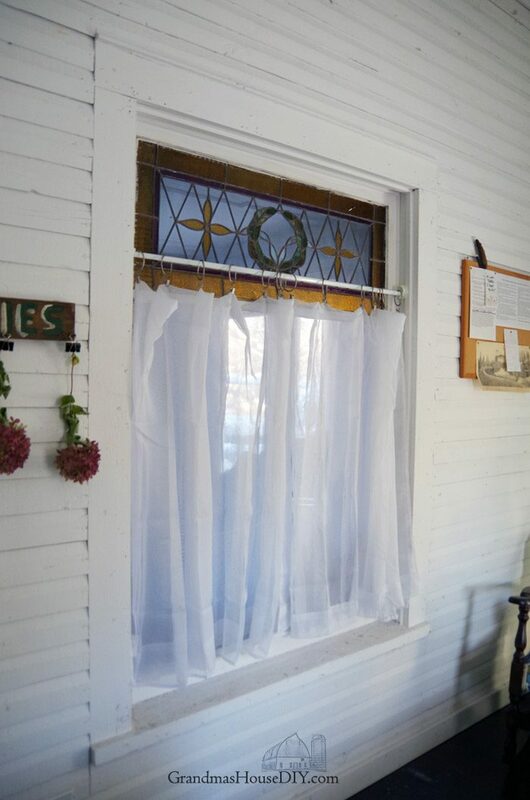 A double layer of a sheer curtain is the perfect solution to give some privacy and not cover your gorgeous stained glass window. 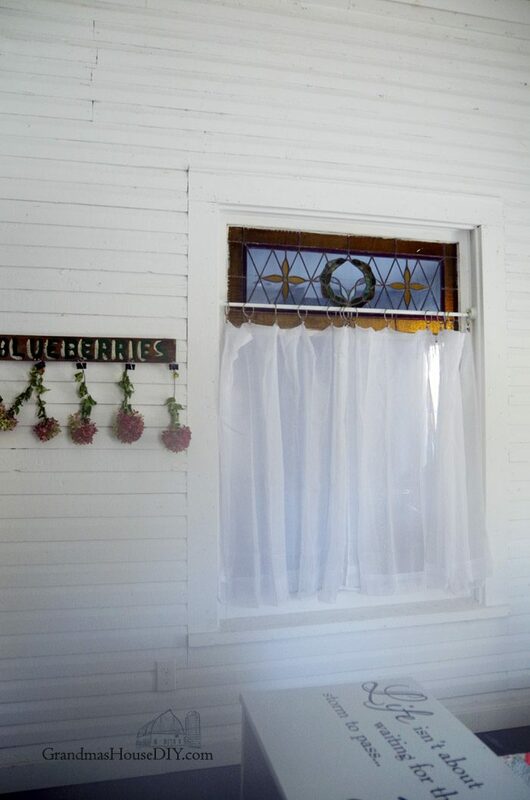 The window looks so beautiful it would be awful to cover it even a little bit. I am a bit jealous that you found a no-sew solution and it turned out perfectly. Looking forward to whats next. 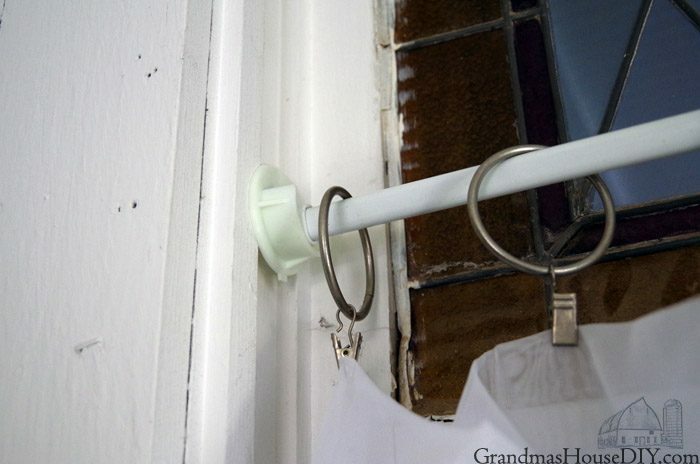 Thanks Leanna, those little curtain clips are ingenius! Ok, you may have just fixed a problem window for me!!! I’d love for you to share over at a new party called Let’s Party https://themarkandjanshow.com/2018/02/07/lets-party-7/ … we look forward to seeing you there! Such a great idea and I love your window! I would like to invite you to come over and link up this post at the Thursday Favorite Things Link Party. Have a great weekend! Thank you Amber, have a great weekend! They really look nice! Thanks for sharing with SYC. Looks so good, and that stained glass is beautiful! 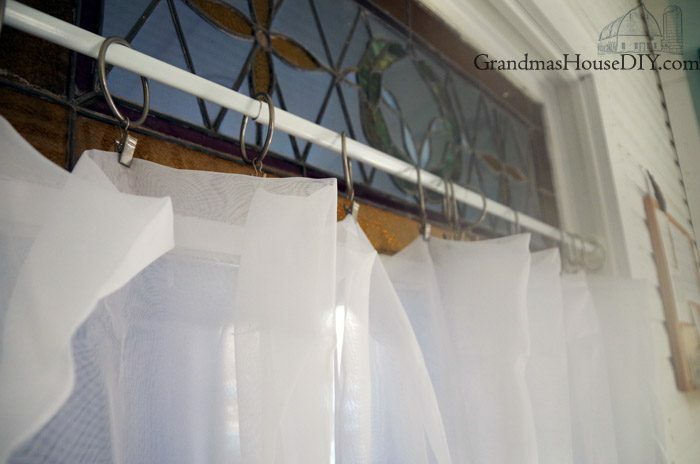 I need something similar in my guest bath, so cross your fingers that my sheers are the right length when folded! It might be ok if they’re not even too! I use those clips for all kinds of stuff. So easy and handy. Found you on Blogger’s Pit Stop Link Party. They are definitely a secret bit of awesome! The curtain is perfect. I’m so glad you didn’t cover that gorgeous window! Have a great week. Anytime Sue! But make sure its in the summer lol winters here have just been brutal!